1 novelty bag of 2 boxes of snaps, 3 boxes of magic snakes, 4 boxes of 8" sparklers, and 7 pieces of party pops. 1 Small novelty bag of 2 boxes of snaps, 3 boxes of magic snakes, 4 boxes of 8" sparklers and 7 pieces of party pops. Throw them! Pop them! Step on them, light them up for instant fun!!! Each popper is full of colorful streamers in red, green, yellow or blue. Simply point the bottle up and away, pull the string and KABOOM!!!! Great for Birthday parties, New Years, graduation, and goodie bags. 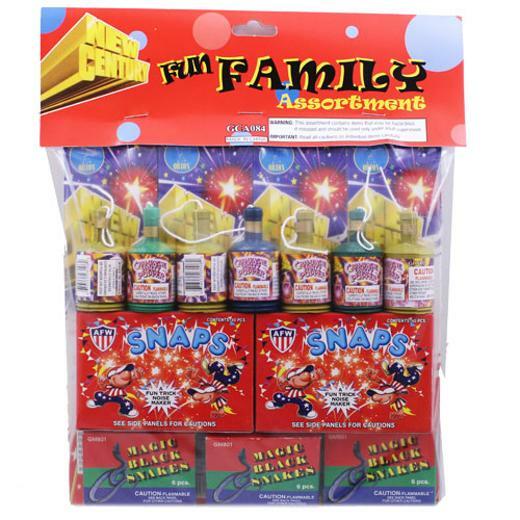 Easy to use fireworks should always be used under adult supervision. Indoor and outdoor use. 8 in. x 9 in. x 2 in. L: 8.0 in. W: 9.0 in. H: 2.0 in.